The cocktail is an art form that peaked in the middle of the 20th century and has been in rapid decline since. As a young lad, I was schooled in the fine art of cocktailing by my father and grandfathers, I learned many valuable lessons that I plan to pass on. I also want to resurrect some of the old classics that vastly surpass the sugary & fruity concoctions made today with their simplicity, elegance and bold flavors. Most of the time I will focus on one drink, and to provide, at least in my opinion, the definitive recipe, but hope to expand to other related topics as I see fit. Please mix yourself a cocktail, read, drink, and enjoy! As the halfway mark of our holiday journey falls on a Sunday just two short weeks before Christmas, I can only hope that the rest of you are feeling better than I am this morning. Apparently there is such thing as too much Christmas spirit. But fear not, along with being one of the all time classic brunch cocktails, the Bloody Mary is also an amazing hangover cure (the shampoo effect). While there is some evidence to discredit the commonly held belief that the Bloody Mary was invented at Harry’s New York Bar in Paris around 1920, I love the bar and its history so I am going to stick with that until proven otherwise. At its most basic level this morning after favorite is a combination of vodka, tomato juice and any number of fruits, vegetables, spices and seasonings. Everybody has their own personal touches to the point that one of the only compliment’s I can still give Delta Airlines is the Bloody Mary condiment tray in the crown room that allows each weary traveler to dress their cocktail as desired. I like this version as it is heavy on the citrus and a packs a nice kick. 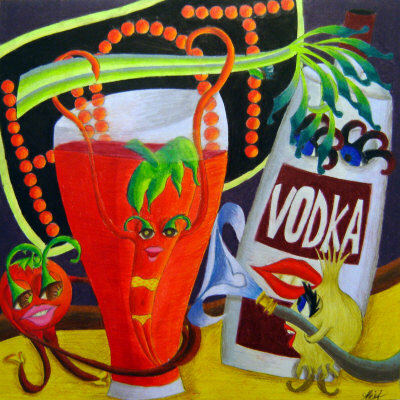 Start by mixing the tomato juice mixture below in a large pitcher and refrigerate until well chilled, it should make enough for six to eight cocktails. The time of day will dictate the amount of vodka to use. Prior to 10:00 AM use use one ounce, from 10:00 to 11:00 AM work your way to an ounce and a half, and from 11:00 to noon work from an ounce and a half to two. Once the clock hits twelve all bets are off, make them as strong as you desire. When ready to serve fill a glass with ice. Add the appropriate amount of vodka, fill glass with tomato mix and stir. Garnish each drink with a lime wedge and a spear of pickled asparagus. Mix first seven ingredients in a large pitcher and chill. For each drink pour one to two ounces of vodka into an ice filled glass. Pour in tomato mixture and stir. Garnish with a spear of pickled asparagus and a lime. 1. Always start with a full glass of ice. There is no such thing as a too much ice. 2. If the drink has olives, cherries or onions, use three. 3. Never apologize for making a drink too strong. 4. When in doubt, add bitters. "You're so smart get your own 5th"
"Keep your cottonpickin' hands off my gin"
"Let's have a bloody Mary"
"Twas a woman who led me down the road to drink. I never wrote to thank her." "Work is the curse of the drinking class." "The three-martini lunch is the epitome of American efficiency. Where else can you get an earful, a bellyful, and a snootful at the same time?" "My rule of life prescribed as an absolutely sacred rite smoking cigars and also the drinking of alcohol before, after and if need be during all meals and in the intervals between them." "Drinking is a way of ending the day." © 2010-2012 Patrick Gibbons. All rights reserved.